Everything is perfect, literally. From the amazing room which is equipped with everything you want, to the amazing breakfast that they served it in your room, I booked room 104 which has more privacy. Jacuzzi was wonderful also . Location is good , in the middle of the island, more calm and quiet area . No much traffic comparing to Thera or Oia, 15 min to Thera and 10 min to kamari beach. Free parking , fast wifi and comfy bed. At last , I would send my deepest gratitude to Theodosia And George who were very welcoming and very great hosts , Theo provided us with very good tips and locations to visit on the island. For sure I will be back next summer and I would recommend this hotel to anyone who is visiting Santorini. Great, friendly staff. Clean rooms and clean bathrooms (!) decorated with taste. Good breakfast food with options. Huge property with lots of room. Nice pool and comfortable patio furniture. Really excellent property & quality of service. Staff were delightful and extremely helpful. Excellent people. Each and every person we met there was just amazing. Excellent rooms. Had the best time there!! 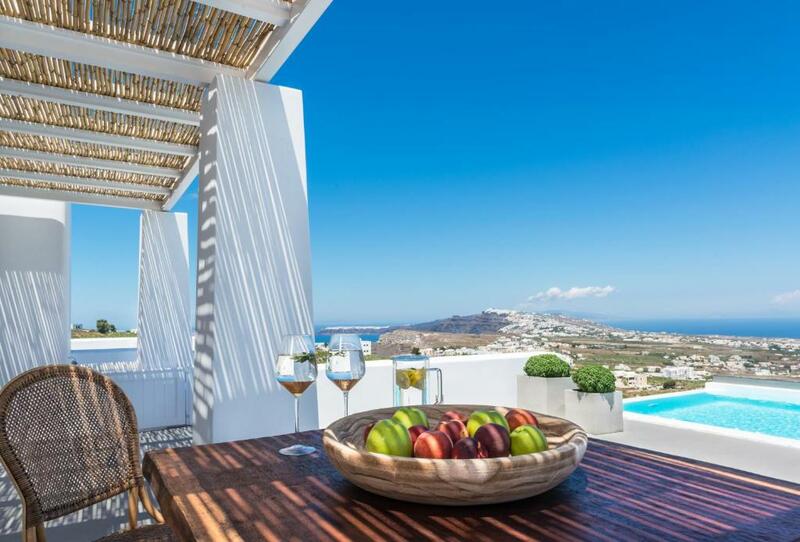 We loved that the property was centrally located- it afforded peace and quiet with a panoramic view of the island. We can't say enough about how much we enjoyed our stay, I would highly recommend it to everyone!! It really felt like home. The staff were very friendly, helpful & thoughtful. The property is beautifully decorated and very spacious, everything you need is provided to the smallest details like a blow dryer and a hair straightener! One of the most private properties I have visited. Breakfast is served in your room which was a pleasant experience. Less than 10 mins away from the Airport. The best place to spend a quiet, romantic holiday. The staff especially Irena, Angela and George are so helpful and would go out of their way to make you feel so comfortable. Lock in a great price for White & Co. Exclusive Island Villas – rated 9.8 by recent guests! White & Co. 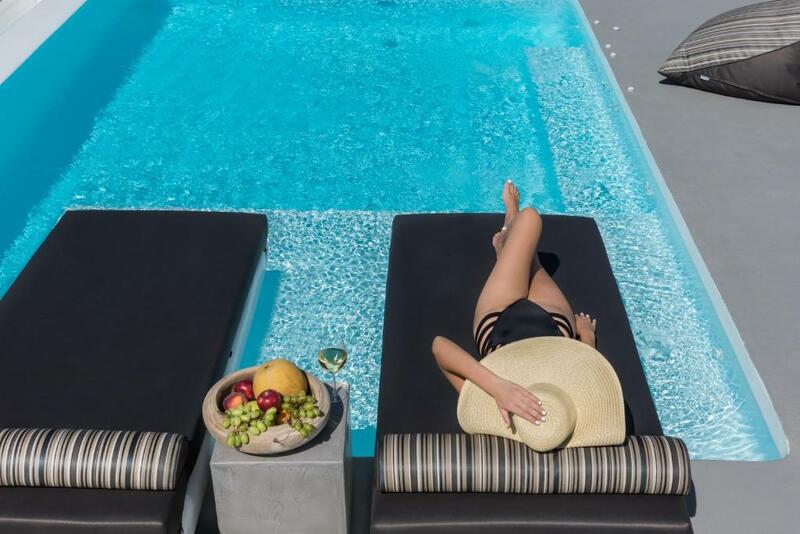 Exclusive Island Villas This rating is a reflection of how the property compares to the industry standard when it comes to price, facilities and services available. It's based on a self-evaluation by the property. Use this rating to help choose your stay! One of our best sellers in Pyrgos! 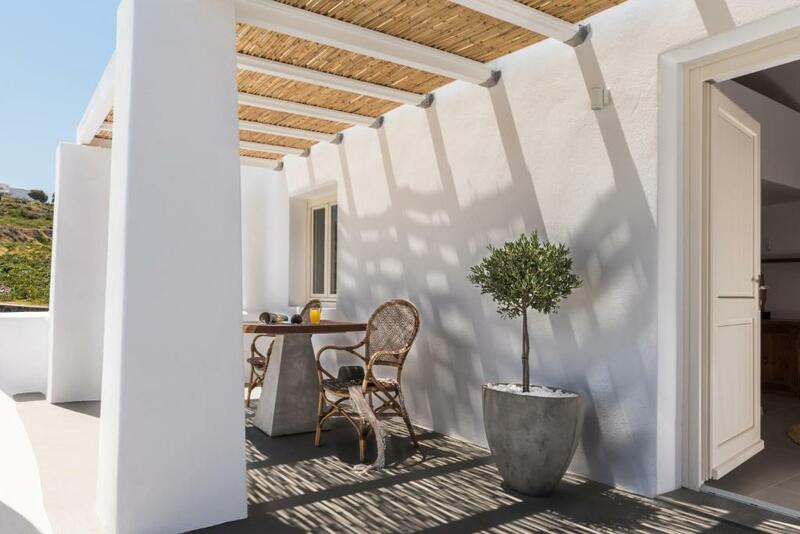 Located in Pyrgos, 1.2 mi from Art Space Santorini, White & Co. features air-conditioned rooms with free WiFi throughout the property. Guests can enjoy the on-site restaurant. Free private parking is available on site. A flat-screen TV with satellite channels, as well as an iPod docking station are featured. Certain rooms feature a seating area where you can relax. Views of the sea, garden or city are featured in certain rooms. Every room has a private bathroom. For your comfort, you will find bathrobes and slippers. Guests can enjoy various activities in the surroundings, including horse riding and hiking. Santorini (Thira) Airport is 2.5 mi from the property. When would you like to stay at White & Co. Exclusive Island Villas? 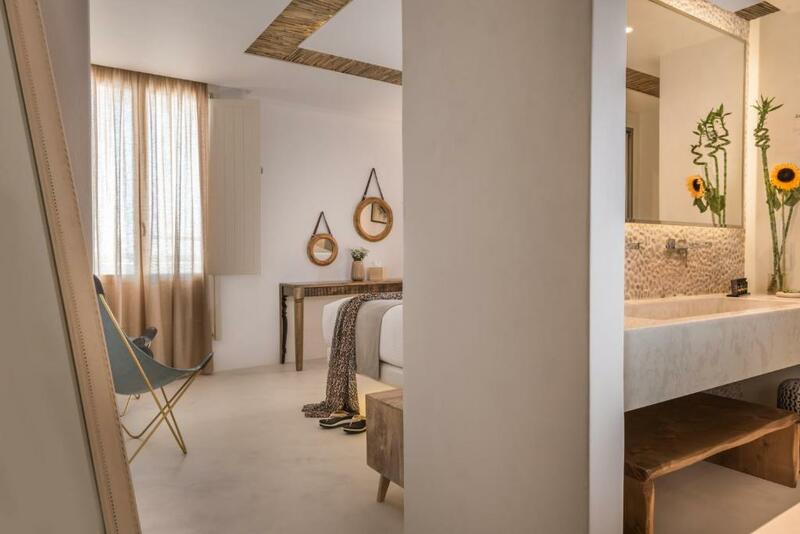 This double room features a balcony, mini-bar and soundproofing. Pool access is available. White & Co. Luxury Suites is a brand new addition in Pyrgos Santorini. 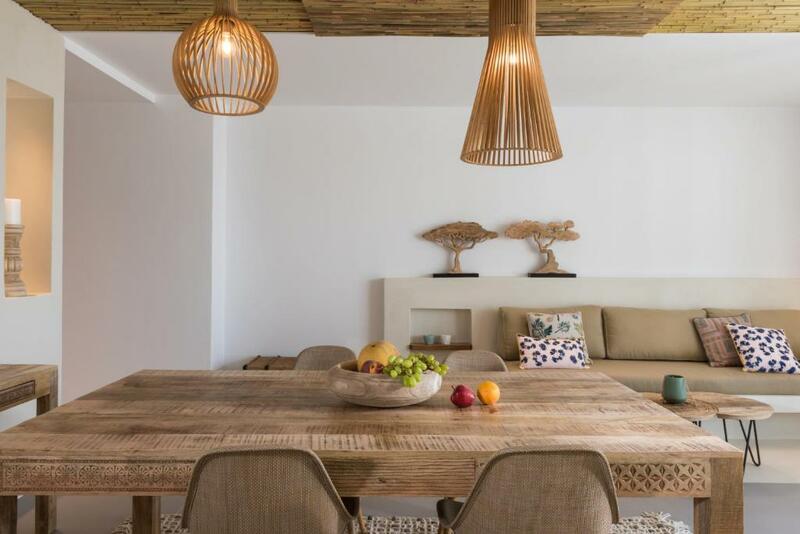 The suites are brand new, decorated in a bohemian style combining local tradition and luxury living. House Rules White & Co. 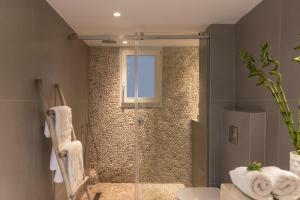 Exclusive Island Villas takes special requests – add in the next step! White &amp; Co. Exclusive Island Villas accepts these cards and reserves the right to temporarily hold an amount prior to arrival. White & Co. Exclusive Island Villas accepts these cards and reserves the right to temporarily hold an amount prior to arrival. Would have preferred if there was a drop and pick up service to Fira. Beautiful house, great stay, the host people are all very nice and thoughtful. After checking out, They provided us even a small room before we went to airport so my parents can chill a bit. Every thing is perfect! The staff were amazing! They helped us arrange a buggy so we could make our way around the island. They also recommended some fantastic places to eat and they spoke English very well!! Everything!!!! I couldn’t believe this place when we arrived. From the staff to the villa to the views, everything was incredible. Was such a special place to celebrate my big birthday and I wouldn’t have changed a single thing! They only have 3 villas and one suite for now I hope they expand! It was an incredible experience. Can't be faulted. Everything! The staff were amazing. Very friendly and helpful. The day room was incredibly helpful while we waited for our room. The Villa was gorgeous, stylish and perfect beyond words. We were so impressed with the efficiency of the staff and the farewell gift was a really lovely touch. it's a bit hard to find the location as the very first arriving. Everything there is perfect, clean, spacious, well designed, Excellent view, helpful staff and so on. We loved everything about the White & Co.! The staffs were very friendly and helpful, they gave us a lot of recommendations for places to visit in Santorini which weren't as touristy and crowded. The villa was fabulous, spacious and clean. One of our best hotel experience indeed, thank you!